JUSTICE MINISTER CHARLIE Flanagan has told the Dáil that he has apologised to whistleblower Maurice McCabe and his family on behalf of the State. Flanagan said that what McCabe and his family had to endure was unacceptable, and added that when he spoke up about his concerns, he should have been “supported and protected”. Charleton said it had been orchestrated by former Garda Commissioner Martin Callinan and this was “actively aided” by Taylor in his report published last Thursday. Taylor had alleged that his involvement in the smear was under the orders of Callinan. Charleton however found that while Callinan and Taylor were “in it together”, that Taylor didn’t do it “under orders”. Speaking in the chamber today, Flanagan said McCabe deserved an apology and said he had offered one on behalf of the State. He said he would be meeting McCabe in the coming days to repeat that apology face-to-face with the whistleblower. He welcomed the fact the Garda Commissioner Drew Harris has also been in touch with McCabe. 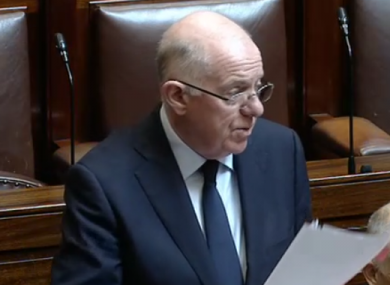 Flanagan said the government would reflect on the Disclosures Tribunal report, adding that Charleton “did not mince his words”, stating there was no ambiguity in the report. He added that it made for “very stark reading”. The justice minister said one key aspect jumped out of the report to him when Charleton raised the issue of gardaí being honest and their obligation to serve the people of Ireland rather than sticking up for one another. Had that been followed, these events might not have happened, said Flanagan. He said these values should be foremost in the minds of civil servants. Email “Justice Minister apologises to whistleblower Maurice McCabe on behalf of the State”. Feedback on “Justice Minister apologises to whistleblower Maurice McCabe on behalf of the State”.